Progression, stages of the disease from the Alzheimer’s Association. If you’ve met one person with Alzheimer’s disease, you’ve only met one person. Everyone with Alzheimer’s experiences the disease differently. However, patients with the illness tend to follow a similar path from the beginning of the disease to its end. The key is understanding the progression and stages of Alzheimer’s disease. One thing is certain: the symptoms of Alzheimer’s disease get worse over time. But because Alzheimer’s affects people in different ways, each person will progress through the stages differently. Although the three stages of Alzheimer’s disease are just a guide, you can be better prepared and plan for what’s to come by understanding what to expect from each stage. 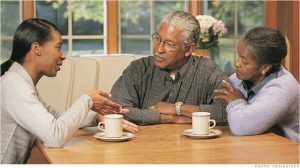 The Alzheimer’s Association has a great guide on the overall progression of the disease, as well as details on each stage. You can read more about the stages of Alzheimer’s Disease. If you are one of the more than 15 million Americans providing unpaid care for a loved one with Alzheimer’s or other dementias and you need assistance, FirstLight Home Care has developed a unique Dementia Program that builds services around the individual, not the disease. It’s a personalized, engaging dementia home care approach to help people who want at-home care to keep at least their surroundings familiar in a world suddenly filled with uncertainties. Contact FirstLight Home Care today to learn more about our Dementia Program and other home care services. You are right about Alzheimer’s, every senior feel differently based on their age, gender, and living environment. Thanks for sharing the stages. Family caregivers should learn and research about the symptoms if their loved one has problems related to memory. Hethre, thank you for reading and for taking the time to provide feedback. Yes, as caregivers, we should all be aware of the potential signs and symptoms of Alzheimer’s and other related dementias. Thanks for differentiating different stages of Alzheimer’s disease. Such disease is curable with proper medication and precautions. However, a lot of people don’t have any idea about this disease and such people characterizes the symptoms of this disease as the result of aging. Such disease affects the reasoning and memorizing ability of a person which has a significant influence on the social life of the patient.